With all this talk about the deficit and the possibility of the country going bankrupt, I turn to thoughts of real estate. Now I don’t believe the country will go bankrupt… Government will not let that happen, they can’t afford to let that happen. The dollar may lose value, social security might be at further risk, the recession might last a little longer, but the US will not go bankrupt. 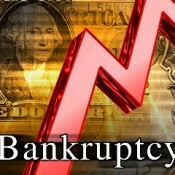 Perhaps broke but not bankrupt. However the fact still remains that we as a country, are in a financial crisis, and as far as I’m concerned Real Estate is one of the few investments that provide financial security. Think about it: when you purchase property, land, buildings, etc… you own it. You get a piece of paper, known as a deed, saying that this piece of land is yours. Real Estate will always have value, people will always need a place to rest their head, business will need office space. Schools, hospitals, churches, restaurants will always need a building. No matter how fiancially unsecure the country is, certain things will always be maintained. Your little piece of the American pie will always have worth. So, if you can buy something but it. I understand that real estate might not be for everyone. Some people are buying gold and silver. Some are buying stocks and bonds. For me, it’s property, an investment that’s tangible, longterm, fruitful, and owned directly by me! In my previous blog I speak about why invest in real estate, and now I’m telling you how to secure your future in a country that is financially unstable. INVEST IN REAL ESTATE! !